Cafepress Store What's New? Available Animals Iguanas Bearded Dragons Leopard Geckos Crested Geckos Snakes Cyclura Iguanas Blue Tongue Skink Uromastyx Tegus Tortoises Turtles Food in General Good Books Rescue Search Photos Contact NEW! Pete Cam! This site is dedicated to getting the word out on how to properly care for several species of reptiles in captivity. Many reptiles are obtained by people with little or no knowledge of how they should be kept. Unfortunately many pet stores also give out faulty information when selling these animals. There are even some vets out there giving out faulty or incomplete information. Pugsley (feeling particularly patriotic over there on the right) came to us in the spring of 1994. His owner made us promise to feed him canned cat food. This is just the sort of misinformation we are trying to dispel. 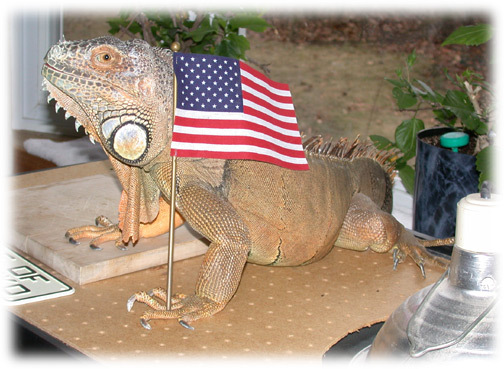 We continue to strive to get the word out on how to get iguanas and other reptiles set-up properly for a long, healthy life. Please click on the links provided to find out more about the captive care of these awesome animals. Check out some great books on reptile care at my Book Store. If you have any questions please feel free to ask. We can be reached via email at reptileszz@cox.net. We answer all emails. If you do not get a response from us within a week check your spam filters. Everyone should read this excellent description on how to avoid MBD (Metabolic Bone Disease) and calcium deficiencies in reptiles at Dr. Ivan Alpfonso, DVM's blog Calcium Deficiencies: The "secret" to avoid them. I am not a vet, nor can I diagnose problems accurately over the internet. If you email me about a sick reptile chances are I am going to tell you to find a vet. Please see www.herpvetconnection.com for one in your area. © 2016, www.reptilecare.com. All rights reserved.